WHat is big brum sleepout? 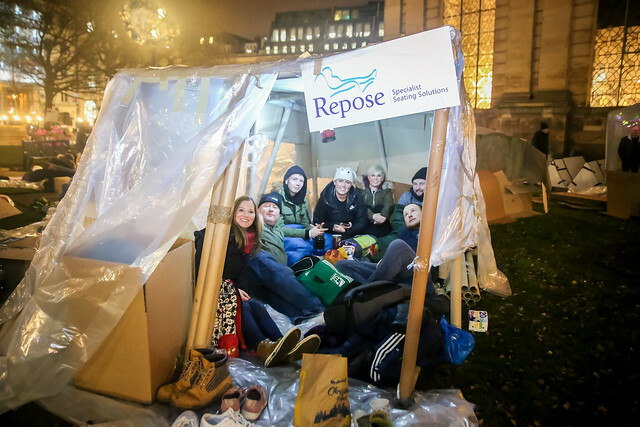 At this free event we challenge you and your group of friends, family or colleagues to build a dwelling out of cardboard and plastic sheeting and then sleep in it overnight in the grounds of Birmingham Cathedral in winter! We house over 1000 young people in Birmingham and over 1500 across the West Midlands in our 34 supported accommodation schemes, plus we help thousands more young people with face to face support and advice, but due to government cuts these services are at risk. We have to raise £1 million ourselves this year. BIG Brum SleepOut is our largest event of the year. We are hoping to make it bigger and better than ever to help us reach this target and ensure our services can continue into the future. Click on the photo below to launch the interactive photo album and use the arrows to view the whole album. Click on a photo to download it. You will be referred to Flickr to do this. Return to this site to continue viewing the album. If you didn't take part in this event you please contact St Basils to ask permission before using the photos. Email fundraising@stbasils.org.uk. A huge thank you to our main sponsors of this event: National Express who sponsored both this event this year and our Coventry SleepOut. Thanks to them our costs of hosting these events has been much lower. We would also like to thank our regular event partners Jaffabox for their year-upon-year support with mountains of cardboard boxes and Birmingham Cathedral for offering to help us host this brilliant event again this year. A massive St Basils thank you goes out to our other business supporters Greggs Foundation, Speedy Hire, Smurfit Kappa Recycling, Lloyds, The Birmingham Mail, Langar Aid and Squire Patton Boggs for their help with this event.